5 minDeploy your first datacenter with Consul. 8 minThis document provides recommended practices and a reference architecture for HashiCorp Consul production deployments. 8 minGuide for deploying your first cluster. 10 minConsul provide the snapshot tool for backing up and restoring data. In this guide you will learn how to use both. 15 minConsul provides an optional Access Control List (ACL) system which can be used to control access to data and APIs. 16 minThis guide walks though securing your production Consul datacenter with ACLs. 12 minLearn how to create certificates for Consul. 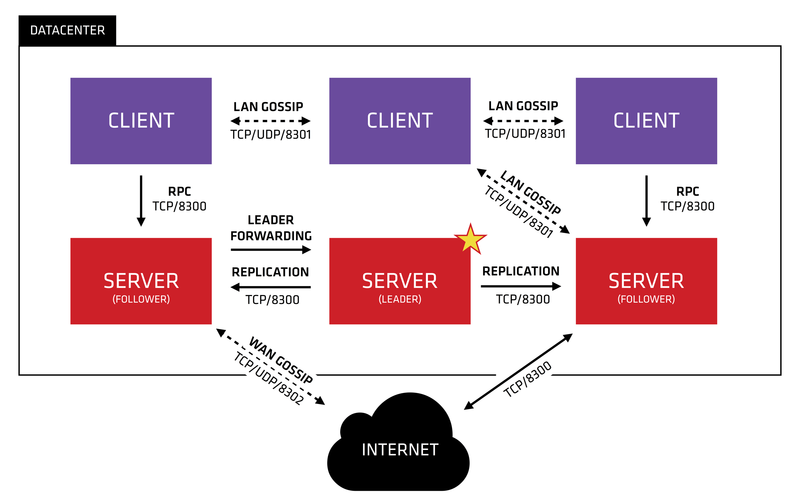 10 minThis guide covers how to encrypt both gossip and RPC communication. 3 minWhat's next after setting up your first cluster? Review the production readiness checklist. This deployment guide covers the steps required to install and configure a single HashiCorp Consul cluster as defined in the Consul Reference Architecture. This deployment guide is designed to work in combination with the Consul Reference Architecture. Although not a strict requirement to follow the Consul Reference Architecture, it is highly recommended that you are familiar with the overall architecture design; for example installing Consul server agents on multiple physical or virtual (with correct anti-affinity) hosts for high-availability. To provide a highly-available single cluster architecture, we recommend Consul server agents be deployed to more than one host, as shown in the Consul Reference Architecture. These setup steps should be completed on all Consul hosts. These instructions are for installing and configuring Consul on Linux hosts running the systemd system and service manager. Precompiled Consul binaries are available for download at https://releases.hashicorp.com/consul/ and Consul Enterprise binaries are available for download by following the instructions made available to HashiCorp Consul customers. You should perform checksum verification of the zip packages using the SHA256SUMS and SHA256SUMS.sig files available for the specific release version. HashiCorp provides a guide on checksum verification for precompiled binaries. Unzip the downloaded package and move the consul binary to /usr/local/bin/. Check consul is available on the system path. The consul command features opt-in autocompletion for flags, subcommands, and arguments (where supported). Enable autocompletion. Create a unique, non-privileged system user to run Consul and create its data directory. Systemd uses documented sane defaults so only non-default values must be set in the configuration file. Create a Consul service file at /etc/systemd/system/consul.service. Description="HashiCorp Consul - A service mesh solution"
Consul uses documented sane defaults so only non-default values must be set in the configuration file. Configuration can be read from multiple files and is loaded in lexical order. See the full description for more information about configuration loading and merge semantics. Consul server agents typically require a superset of configuration required by Consul client agents. We will specify common configuration used by all Consul agents in consul.hcl and server specific configuration in server.hcl. NOTE Replace the datacenter parameter value with the identifier you will use for the datacenter this Consul cluster is deployed in. Replace the encrypt parameter value with the output from running consul keygen on any host with the consul binary installed. datacenter - The datacenter in which the agent is running. data_dir - The data directory for the agent to store state. encrypt - Specifies the secret key to use for encryption of Consul network traffic. The retry_join parameter allows you to configure all Consul agents to automatically form a cluster using a common Consul server accessed via DNS address, IP address or using Cloud Auto-join. This removes the need to manually join the Consul cluster nodes together. NOTE Replace the retry_join parameter value with the correct DNS address, IP address or cloud auto-join configuration for your environment. retry_join - Address of another agent to join upon starting up. The performance stanza allows tuning the performance of different subsystems in Consul. raft_multiplier - An integer multiplier used by Consul servers to scale key Raft timing parameters. Setting this to a value of 1 will configure Raft to its highest-performance mode, equivalent to the default timing of Consul prior to 0.7, and is recommended for production Consul servers. For more information on Raft tuning and the raft_multiplier setting, see the server performance documentation. The telemetry stanza specifies various configurations for Consul to publish metrics to upstream systems. If you decide to configure Consul to publish telemetry data, you should complete the Monitoring and Metrics guide at the end of the Day 1 learning path. NOTE Replace the bootstrap_expect value with the number of Consul servers you will use; three or five is recommended. server - This flag is used to control if an agent is in server or client mode. bootstrap-expect - This flag provides the number of expected servers in the datacenter. Either this value should not be provided or the value must agree with other servers in the cluster. Consul features a web-based user interface, allowing you to easily view all services, nodes, intentions and more using a graphical user interface, rather than the CLI or API. NOTE You should consider running the Consul UI on select Consul hosts rather than all hosts. Consul client agents typically require a subset of configuration required by Consul server agents. All Consul clients can use the consul.hcl file created when configuring the Consul servers. If you have added host-specific configuration such as identifiers, you will need to set these individually. Enable and start Consul using the systemctl command responsible for controlling systemd managed services. Check the status of the consul service using systemctl. In this guide you configured servers and clients in accordance to the reference architecture. This is the first step in deploying your first datacenter. In the next guide, you will learn how to configure backups to ensure the cluster state is save encase of a failure situation. To create a secure cluster, we recommend completing the ACL bootstrap guide, agent encryption guide, and certificates guide. All three guides are in the Day 1 learning path. Finally, we also recommend reviewing the Windows agent guide and Consul in containers guide for a mixed workload environment.